Provides 27 simple ideas for the improvement of instruction. It lays the foundation for the ideas found in the Thinker's Guide How To Improve Student Learning. For orders of 500 or more copies, please email us atcct@criticalthinking.org for special pricing. Although bringing critical thinking into the classroom ultimately requires serious, long-term development, you don’t need to sweat and slave and thoroughly understand critical thinking to begin to make important changes in your teaching. Many simple, straightforward, yet powerful strategies can be implemented immediately. In this guide we offer a sampling of such suggestions. They are powerful and useful, because each is a way to get students actively engaged in thinking about what they are trying to learn. Each represents a shift of responsibility for learning from the teacher to the student. These strategies suggest ways to get your students to do the hard work of learning. Many enable you to take advantage of what students already know and what they are able to figure out for themselves. Many involve students working together. All too often students get stuck, or don’t understand what they are supposed to do. Several students working together can correct each other’s misunderstandings and can make much more progress on tasks. When one student gets stuck, another might have just the right idea to move things along. This enables students to become responsible for more of their own learning. Over time, they begin to adopt the strategies they see their peers use successfully and learn to ask themselves critical questions raised by their peers. Another advantage of the following suggestions is their wide applicability. Most can be fruitfully applied to any subject, any topic. Most can become standard practice - techniques you continually use. For some of these strategies, we provide examples geared to different content they might be used to teach. This is not necessarily so. Often students’ failure to do well, to apply what they have covered, to remember in the fall what they learned the previous spring, results from the above naive misconceptions about what learning requires. Above all, learning requires thinking, critical thinking. To learn, one must continually ask "What does this really mean? How do we know? If it is true, what else would be true?" At the heart of our approach is the conviction that, ultimately, learners must answer these questions for themselves in order to learn, to know, to truly understand. Answers you provide do not entirely sink in unless students’ minds are ready to take them in. 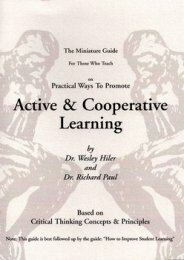 This Guide contains suggestions, or "teaching tactics", that provide ways to begin this process of enabling students to think their way through the material they are expected to learn, to learn how to use what they learn, and use the power of their own minds to "figure things out".